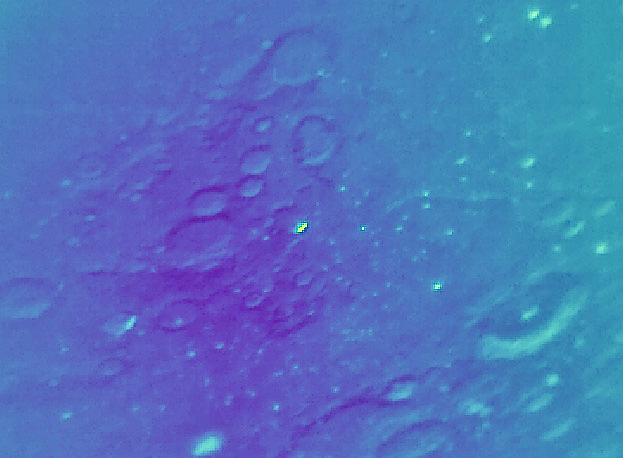 False-colour contrast-enhanced thermal image of part of the Moon's surface during a lunar eclipse. 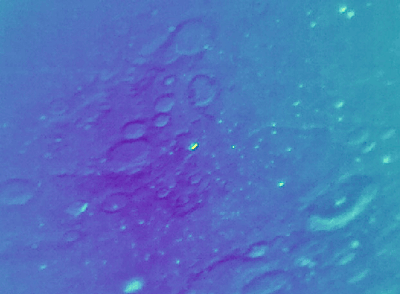 The bright patches are some of the many "hot spots" where the lunar soil was warmer than its surroundings. Credit & ©2019 Maisie Rashman, Iain Steele, LT Group. The Liverpool Telescope (LT) recently made mid-infrared (mid-IR) images of the Moon during January's lunar eclipse. This was a first for the LT, which normally observes in the optical or near-infrared part of the spectrum. Observing in this part of the spectrum is difficult because the telescope and instrument optics, plus the Earth's atmosphere itself, actually glow in this wavelength range — it's like trying to observe optically in the daytime with a luminous telescope. Astronomy in the mid-IR with ground-based telescopes is therefore a tricky process, normally involving cryogenically cooled instruments, and "chopping" and "nodding" techniques to rapidly alternate observations of the target with those of a blank patch of sky nearby. The latter signal is subtracted from the former to remove the extra signal from the atmosphere and equipment, leaving just the signal from the target. By contrast, these observations were made as part of a project to see what data could be collected with an off-the-shelf uncooled thermal infrared microbolometer array camera, in this case a FLIR Tau 2 640, sensitive to the 7-14 micron wavelength range. These cameras are much cheaper than their cooled counterparts. The observations began as the Moon entered the Earth's shadow and sunlight was progressively cut off from the lunar surface. Differences in thermal conductivity of the lunar regolith caused some places to cool at a slower rate than their surroundings, becoming apparent as many "hot spots" in the images. Maisie Rashman, co-investigator in this experiment and a PhD student at Liverpool John Moores University's Astrophysics Research Institute, said "Once partial eclipse started we were able to see lots of small very bright, almost point, sources appear. Around the maximum, the temperature of the moon had dropped enough that the edge of the moon was almost indistinguishable." This isn't the first time the Moon has been observed in mid-IR during an eclipse, but as LT Director Prof. Iain Steele says, it's "the first ever infrared image of an eclipse taken with a microbolometer array camera," and also the first time the LT has ventured into the mid-IR part of the spectrum. The project was partly supported by a Royal Astronomical Society Patricia Tomkins grant.